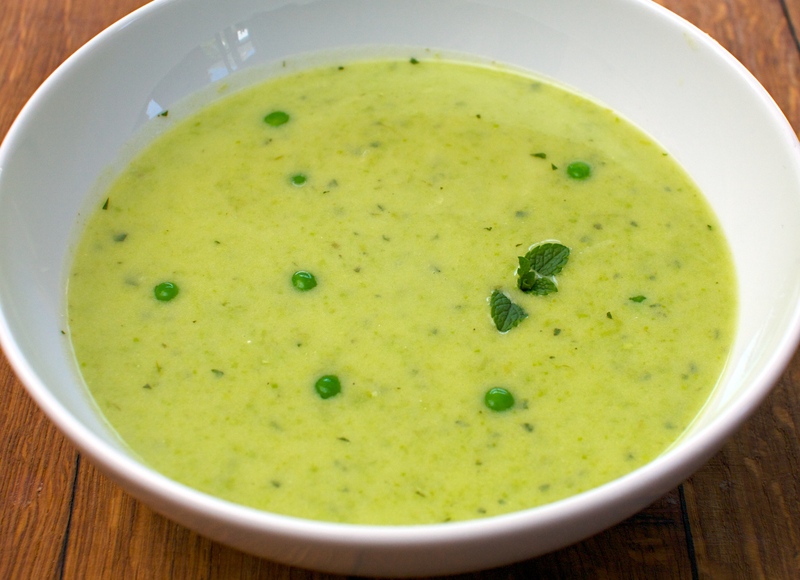 Finally we have warm enough weather to stop thinking about soup so much. This is more of a warm weather soup. Nice and light with really fresh flavours. You can even eat it chilled if you like. Put the scallions, garlic, potato and stock in a large pot and bring to the boil, then turn down and simmer for about 15 minutes or until the potato is very soft. Blanch 3 tbsp of the shelled peas in boiling water for 2-3 minutes, drain, put in a bowl of cold water and set aside to use as a garnish at the end. Add the rest of the peas to the pot and simmer for 5 minutes. Stir in the mint, sugar and lemon/lime juice, then blend until smooth. Stir in the buttermilk or soured cream and season and reheat gently if necessary (don’t let it boil though or it might curdle). Garnish with the drained peas to serve. This looks delish!! So refreshing for the summer! I need to try it!